Kampala Lord Mayor Elias Lukwago has sued the Minister for Kampala Betty Kamya over what he calls her interference. In a suit filed at the High Court this morning, Mr Lukwago claims that Ms Kamya is interfering with his executive by illegally passing off as the political head of the city whereas not. Lukwago claims his mandate to serve as the duly elected mayor of the city has been usurped by Kamya who even took a decision on the January 23 to suspend council meetings where deliberations and decisons on how to govern the city are made . In his argument contained in court documents obtained by PML Daily, Lukwago claims that Ms Kamya’s decision to stall council meetings on grounds that they are illegal and no longer relevant to the city was irrational and unreasonable . Lukwago is now seeking orders to quash Kamya’s decision regarding the legality of Council meetings and another decision that subjects all his travels as the Lord Mayor to a “ministerial permit ” . Lukwago claims such decisions are an infringement and abuse of his rights and freedoms . Lukwago further seeks orders to compel Kamya to put in place a metropolitan physical planning committee as required by the KCCA Act arguing that the absence of this committee negatively impacts him in the execution of his duties of developing and strategizing for the city. 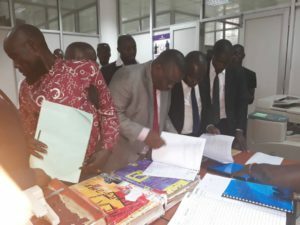 Through his own law firm of Lukwago and company advocates, Lukwago contends that unless court intervenes and restrains Kamya from making such irrational decisions and passig-off as the Lord Mayor , the sovereignty of the people of Kampala will be put in jeopardy and hence forth affect the social contract he made with his voters in May 2016. Mr Lukwago’s suit comes at the peak of infighting between him and Ms Kamya who is backed by the division mayors of Kampala. Last week Mr Lukwago was engulfed in a battle over who should represent Kampala city at the World Bank forum in Malaysia. The Lord Mayor’s office accused Emmanuel Serunjogi, the Kawempe division mayor, and Nakawa division mayor Ronald Balimwezo of working for his down fall. Lukwago was expected to attend the forum this week, but highly placed sources at City Hall told PML Daily that under the instruction of Beti Kamya, the Minister for Kampala, he was denied facilitation. When this website contacted Lukwago for a comment, he declined to respond. But two sources at her ministry revealed that Lukwago was blocked because he failed to make accountability for the trips he has made ever since he took office.